This introductory series for men will introduce you to fitness benefits that are very different from the ones you’d traditionally find at the gym. Dynamic stability, increased mobility and flexibility, functional core control – these are all things you’ll learn in this series of Pilates classes presented in a setting geared specifically for men. You’ll work muscles you never knew you had, and find a new kind of ease in your body. Strength, mobility, improved function and performance: Pilates is a a fabulous cross-training tool. If you’re a weekend warrior starting to feel a little back or joint pain… we can help you with that too. A small group class format (maximum 4 people) means that you are getting lots of one-on-one attention to your needs during class. In your private training session, we’ll drill down to your particular needs and goals to give you an even clearer focus and intention for your group training. This is like personal training in a small group setting! Register here, and you’ll be enrolled in all 7 Monday evening classes. How you move matters! It’s about more than just muscle. If you’re ready for something a little different, join us! We’re excited to welcome IIHPT Certified Master International Instructor, Trista Zinn back to Vancouver this spring! 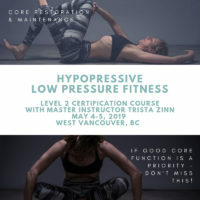 On May 4-5, Trista will be teaching a Hypopressives Level 2 Certification Course at the West Vancouver Dance Conservatory. This Level 2 course will provide students with a more in depth theoretical understanding of the HYPOPRESSIVE technique. The advanced and dynamic series HYPOPRESSIVE LPF exercises program will be practiced at length to ensure you are comfortable with a new program and progressions you can introduce to your clients as they progress from static poses into a dynamic series. If you’ve completed your Level 1 and you’re ready for more, join us for the next level in your training!